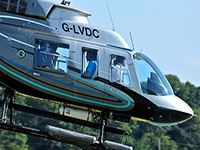 Website and processes: 24 Jun 16 Nick C., 5/5 Excellent "I was very impressed with the service and the flight itself in Norfolk, the instructor was tremendous and we had a superb flying experience along the coast. " Then it's your turn; climbing gracefully to over 1,000 feet and accelerating to over 120 miles an hour, you will interact with the pilot via the headset (don't forget to listen out for air traffic on the radio! ), swooping over the landscape and then settling gently back on the ground. The pilot can control the internal temperature of the helicopter, although it can become quite warm on sunny days. Flights typically take place at weekends between February and November except Scotland where we fly all year round. Event takes place at Buxton in Derbyshire . The voucher will have Buxton printed on it, but it can be used from..